The adaptation of Angie Thomas's book The Hate U Give deals with a subject that is an unfortunate part of our lives each day, that of the killing of unarmed black men by police. The film's first trailer arrived tonight at the BET Awards and it's a powerful look at what will be one of a handful of stories taking on this painful subject. 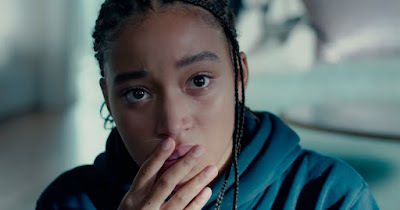 Starring Amandla Stenberg and directed by George Tillman Jr., The Hate U Give centers on 16-year-old Starr Carter, who is inspired to activism after witnessing the fatal shooting of her childhood best friend Khalil by cops. Starr finds herself torn by the two worlds she exists in daily: the poor, mostly black neighborhood in which she lives and the prep school she attends mostly made up of rich white kids. The cast for this is worth the price of admission alone as it includes Algee Smith, Anthony Mackie, Common, Regina Hall, Issa Rae, Russell Hornsby, Dominique Fishback, KJ Apa, and Sabrina Carpenter. There may not be another actor whose choices on screen reflect their personality more than Stenberg. Her activism seems to be a crucial component in many of the roles she takes and I find it fascinating to watch. The Hate U Give opens October 19th.